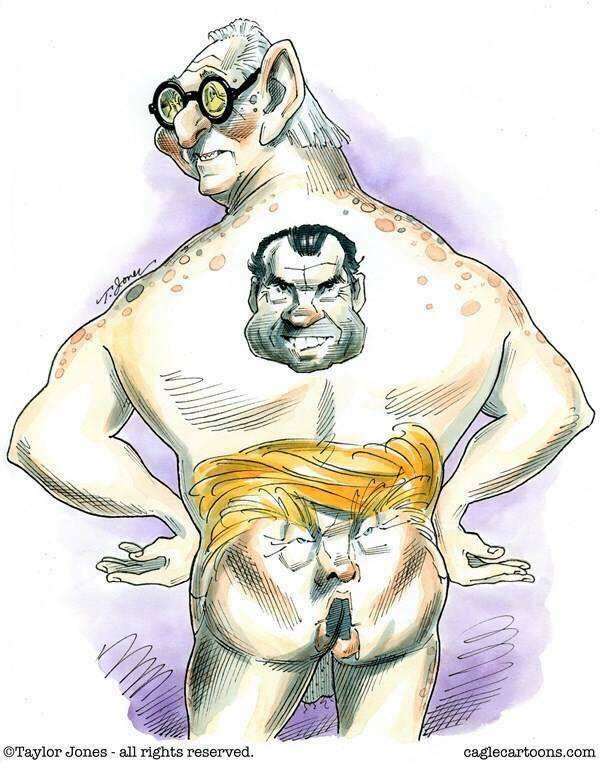 Yeah, I know it'll be hard to unsee this, but, really, would it surprise you if Roger Stone, the Republican Party's newest icon had more than just that Nixon tattoo? We need to be very, very specific when we ask Republicans to reveal all. I bet that backside tattoo of his is standard issue for all Republicans now. It certainly seems so. Now, ask yourself this: Is this some sort of secret Republican body art fashion thing that's been going on right in front of us? Trump has the orange face and those weird white eye rings. We've already seen Stephen Miller painting his head but what's below the neck, and where? What tattoos are people like Lindsey Graham and Kellyanne Conway sporting? Is that Tucker Carlson's real face? Does Brett Kavanaugh have a keg of beer with the words "I like beer" on his back? Does Sarah Huckabee Sanders have a pair of normal eyes inked between her shoulder blades, or somewhere else? Does Ted Cruz have a picture of the Munster's mansion or just Grandpa Munster on his back? I have all sorts of ideas about what tattoos McConnell my have, and none of them are good. Maybe he just has a bag of cash tattooed on his back, or maybe Putin's face, or maybe both. OK. Enough of this. Maybe I should just say, I don't really care, do you? I just hope Roger doesn't turn around. Everyone who has ever worked with roger stone knows that he's an amoral unprincipled belligerent and truculent Nazi fucktard; special emphasis on fucktard. He's also blessed with malignant narcissism and hubris rivaled only by those with the trump surname. Look at the list of shitheads who have employed him. You get the hint. somewhere in every single tattoo you mentioned, there must be a 666. that's a given.